We've all let our dogs lick an empty beer bottle or two, right? What, you haven't? Oh c'mon now, just admit it... your under-aged pup tells a different tale! Whether it was the empty beer bottle that made a great photo opp or the wine glass you set down on the coffee table, you know you're furbaby has had a taste. Zeus' nick-name "booze hound" started after his Daddy thought it was cute for him to lick that empty beer bottle one time... only Zeus decided he liked it and now wants to to lick all bottles (adult beverage or not). 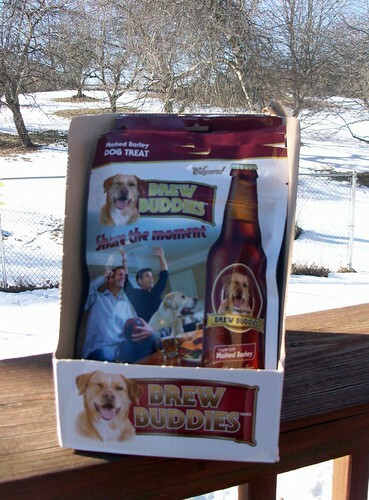 Thanks to Brew Buddies, we can all "Share the Moment" with our 4-legged best friends without any of the guilt! These soft beer bottle shaped treats are crafted with chicken and the same malted barley used in your favorite beer. With the addition of molasses and smoke flavor, this combination creates a unique taste that your best bud won't soon forget. As you can see, Tut was very interested as soon as I tore open a Brew Buddies bag. The Lapdogs all seemed to be quite pleased and begged for more of the cute little bottles to gobble up. The humans love the adorable bottle shape and the fact that Brew Buddies are Made in the USA. If your dogs do not require wheat free treats and are not allergic to chicken, I'd say go grab a bag and enjoy the allure of sharing a brewski with your 4-legged best friend. Whether it's watching the big game or just unwinding after a long day, grab a cold one for yourself, a handful of Brew Buddies for your pack and "Share the Moment." 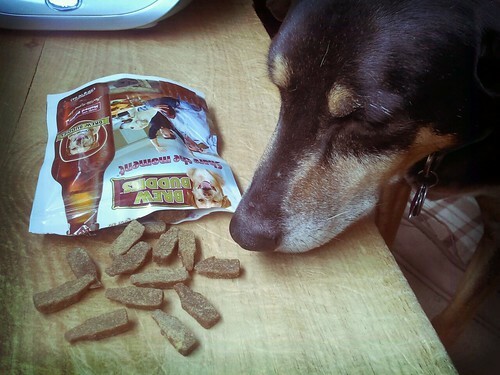 Disclosure: Omega Paw sent a box of Brew Buddies dog treats to Lapdog Creations, free of charge for review purposes. I was not compensated for this review and all opinions expressed are my own. Those look tasty! Thanks for the great review. Too bad they're not Sissy-friendly, but actually, our award-winning homebrewer friend told me to stay away from anything beer-based with Sissy's allergy list anyway... I forget all of his logic, but it made sense. When I told the dogs they were too young to drink, Morgan reminded me that in dog years she's over 90. OK, I guess we can try these. I have to go buy what's left at the store. Great treats!